After communicating with the section foreman about the events of the initial blast in 4 Section, 3 other miners entered the 4 Section to rescue the remaining injured miners. Additional miners from other sections were notified and traveled toward 4 Section to lend assistance. Five of these miners entered the Section and another 4 reached the mouth of the 4 Section. The second explosion resulted in 12 fatalities and widespread destruction. The twelve miners honored with the Carnegie Hero Award for their attempts to save Gaston E. Adams, Jr. were as follows: Raymond F. Ashworth, Nelson Banks, Jr., David L. Blevins, Clarence H. Boyd, Wendell R. Johnson, John Wesley Knox, Dennis R. Mobley, Charles J. Nail, Joe Riggs, Charles E. Smith, Joseph P. Sorah, Terry Milas Stewart. 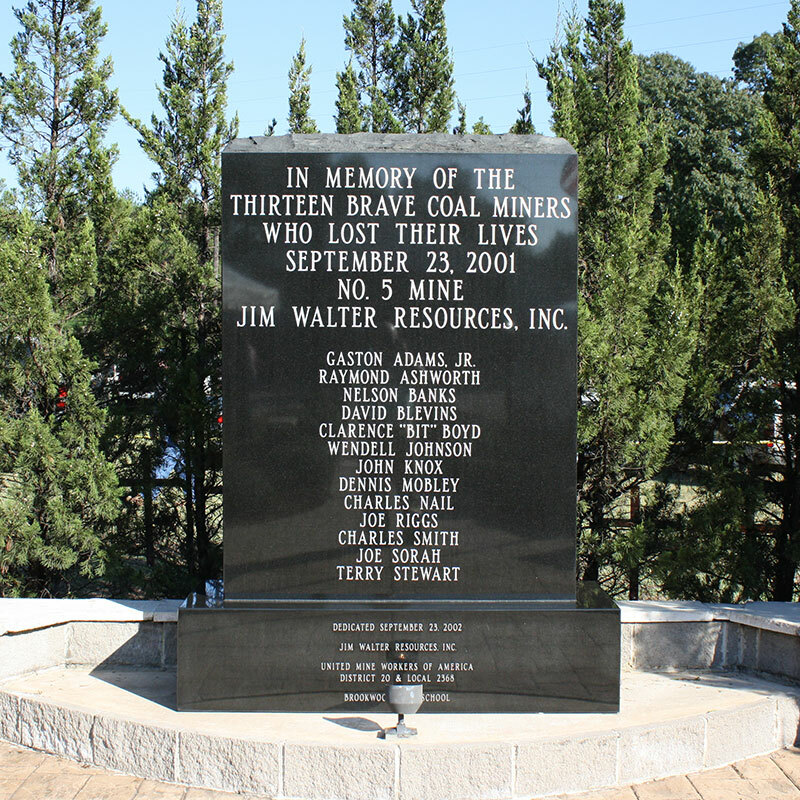 Editor's Note: Thirteen men lost their lives on Sept. 23, 2001 in America's worst mining disaster in 17 years. This is Part I of "Death Underground," a three-part serial that tells the story of what happened that day and why. It is a story of U.S. energy policy, federal mining regulations and the bravery of working men. Brookwood, Ala. -- (AP) A half-mile underground, the earth talks. Usually it just murmurs, but when a few million tons of rock come alive overhead, it makes a racket. On the evening of Sept. 23, 2001, when most of the country was still caught up in the aftermath of 9/11, Tony Key stood in the middle of a 20-foot-wide tunnel burrowed through the heart of Alabama's Blue Creek coal seam, his helmet light tracing an arc through the blackness. The earth was talking to him, and he didn't like what it was saying. It groaned and rumbled like a restless beast as rock shifted above the mine's Four Section, more than 210 stories below the surface - nearly twice as deep as the World Trade Center towers were high. A foot above his head, cracks big enough to poke a fist through snaked across the ceiling. Water dripped from steel rods drilled into the roof to secure it. The soft-spoken husband and father, built tall and round like a bowling pin, had 20 years of experience underground, most of them here, at Jim Walter Resources No. 5 mine, the nation's deepest vertical shaft coal mine. He knew what had to be done. Working quickly, he and two other miners stacked chunks of wood Lincoln Log-style to bolster the ceiling. As one of the miners wedged in a final piece, a foot-long rock broke loose and hit him square on his hard hat. The three men stepped back. Suddenly, the rumbling increased. Roof rods began snapping like .22-caliber rifle shots. Bam! Bam! Bam! Bam! Bam! Then, with a loud "whoosh," a section of roof, big as a house, crashed down just 200 feet away. Roof falls are not uncommon underground. As his companions sat down to swig water from their jugs, Key started back toward the section entrance to find a phone to notify federal mine inspectors. As he trod down the tunnel, the mine's air currents blowing flecks of coal dust into his face, the mine was quiet - but not for long. The No. 5 mine lies about 40 miles southwest of Birmingham in Brookwood, pop. 1,500, a one-stoplight town with a dollar store and a Harley-Davidson dealership. Riding an elevator that drops 15 feet per second, it takes miners 3½ minutes to descend the 2,140 feet to the bottom. There, they enter a sprawling maze of interconnected caverns and honeycombed tunnels that cover 9.2 square miles. Working three round-the-clock shifts, seven days a week, the 382 employees mine one of the most fertile coal seams in the country. The work area called Four Section lies at the end of a tunnel about 3 miles east of the elevator shaft, the closest way out. Workers there first noticed the roof creaking on Friday, two days before the roof fall. Dave Terry, a stocky roof bolter who trained as a member of the elite state mine rescue team in his spare time, spent several hours on the day shift pumping 30 10-foot-long steel rods into the roof to bolster it. The rods are designed to stabilize the roof by binding layers of weak strata to a stronger rock above. The mine's government-approved roof control plan called for steel I-beams and straps to be used when the cracking becomes severe, but Terry's bosses didn't think they were needed. The diminished clamor seemed to indicate the rods were doing the job. Four Section and adjoining Six Section, each comprised of parallel tunnels interconnected by crosscutting passages, were under development. Mining machines, with large, rotating, drum-shaped heads studded with teeth, were hollowing out the coal in a carefully engineered pattern that left large blocks of coal, more than 120 feet long, in place to help support the roof. The plan was to connect the two sections in the back to form a straight, 850-foot "longwall" across the face of the coal seam. Then a machine called a longwall shear would be brought in to cut steadily back and fourth across the coal face, chewing off three feet of coal with each sweep. Friday evening, miners brought in some heavy equipment including an eight-ton battery charging station. With the roof fixed, it seemed safe to leave the high-voltage electrical equipment there over the weekend. On Sunday, Terry worked the day shift, moving equipment around and cleaning up Four Section. At the end of the shift, an employee charged with making safety checks noticed a chunk of a concrete wall crumbling under the weight of the ceiling. Terry's boss asked if he could work overtime to bolster the roof again, so he went outside to check in with his wife. The NASCAR race, being carried on TV, had been delayed, she told him. "If you hurry home, you can still catch it." So Terry turned down the overtime. Being a NASCAR fan probably saved his life. The 382 men who work Jim Walter Resources No. 5 mine labor daily in a permanent night so dark a man can hold his hand an inch from his face and not be able to see it. A tiny misstep can lead to crippling injury or even death. The specter of black lung disease always looms. Their lives, and the lives of 95,000 other coal miners across America, connect directly to yours every time you turn on a light or recharge your cell phone. Today, more than a century after coal fueled an industrial revolution, more than half of the nation's electricity is still generated by burning the black rock miners haul out by the ton. In fact, coal mining is a resurgent industry, recovering from nearly two decades of environmental backlash that made cleaner-burning natural gas the darling of utility companies. Rising natural gas prices and chronic energy shortages are turning America back to coal; the nation's most abundant fossil fuel is the centerpiece of George W. Bush's energy policy. As coal company profits have rebounded, so have fatal mine accidents. Death has always haunted the mines. A century ago, 2,000 to 3,000 men perished annually in coal mine accidents. By the 1980s, safety regulations and better mining technology had driven annual fatalities down to double-digits. Fatal accidents declined further during the industry's lean years, reaching a low of 29 in 1998, according to the federal Mine Safety and Health Administration. Since then, they have been on the rise again. Last year, 42 coal miners perished. Union officials such as Joe Main, head of safety for the United Mine Workers of America, say that safety enforcement declined during the Clinton years and has gotten even worse under the business-friendly Bush administration. As evidence, Main points to a steep drop nationwide in citations for "serious and substantial" violations, the kind that draw the stiffest penalties. But MSHA's head, Assistant Secretary of Labor David Lauriski, says the numbers simply mean mines are becoming safer. Jim Walter officials say it is difficult to compare mines because of differences in size and geology; but by most measures, No. 5 was a comparatively dangerous, problem-plagued mine. In 1995, it led the country in safety violations and had one of the highest accident rates. Injuries and fines for violations dropped sharply over the next three years as the company made improvements; but then both began increasing again as production boomed. MSHA records for No. 5 show some oddities. The mine had the third most violations in the country in 2000 but ranked only 62nd for serious and substantial violations. Of 520 violations cited in 2000, all but 16 were recorded as affecting only one miner, diminishing the fines faced by the company. Some of these single-miner violations were for powdery coal dust in thousands of feet of tunnels. Coal dust makes a mine more prone to explosion. Company officials say the figures reflect how quickly they respond to safety issues. Main, however, says MSHA inspectors were cutting breaks for Jim Walter Resources, a Florida-based conglomerate that brings in $2 billion a year. Main says the company was routinely warned ahead of time about "surprise" inspections, that federal mine safety agency bosses frequently overrode their inspectors' citations, that inspectors often failed to follow up to check if violations were remedied. Lauriski declined to comment on the allegations, but the agency has launched an internal review of practices in its District 11, responsible for JWR mines. 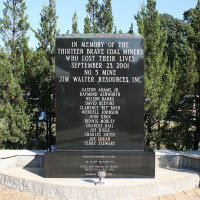 In the six years prior to last year's accident, Jim Walter Resources No. 5 had only one death; but its neighbor, the company's No. 4 mine, had four. In September 2001, the No. 5 mine was in the midst of a quarterly inspection. MSHA officials had found more than 50 violations, including 10 significant and substantial ones. On the day things suddenly went wrong, the mine had 31 outstanding violations, including an accumulation of combustible coal dust and ventilation problems on Four Section. The deadline for fixing them had passed, and no inspector had followed up. By the time Terry went home to watch the NASCAR race, the roof in Four Section was really rumbling. A few men in the skeleton crew of 32 workers that started their shift at 3 p.m. that Sunday needed to get to work building wooden roof supports called "cribs." Michael McIe, an avid hunter and fisherman who normally worked a different area of the mine, was among the men assigned to support the roof. At 5 foot 7, 170 pounds, he was small for a miner, and he wasn't happy about the assignment, which meant lugging heavy timbers. He and three others waited for a manbus, a motorized rail cart, to take them on the half-hour ride to the section. By the time the men got to Four Section and started building the cribs, it was 4 p.m. They had been at it for about an hour and 15 minutes when the house-sized section of roof fell. As Key, the foreman on the job, turned away to find a telephone to alert inspectors, his first thought was of gas - the colorless, odorless methane that lurks in the beds of the Blue Creek coal seam. Methane is commonly associated with coal, but Jim Walter Resources No. 5 is an especially gassy mine. Here, boreholes driven into the coal beds to free trapped methane are not only a safety measure but a profitable enterprise. Twenty million cubic feet of methane a day is liberated from No. 5 and sold to a natural gas company. Roof falls can release pockets of gas into the tunnels; if the air in them becomes 5 to 15 percent methane, the slightest spark can cause an explosion. As a precaution, mining machines are built to automatically shut down when gas levels exceed 2 percent, and company and union policy discourage workers from operating equipment when concentrations reached even 1 percent. However, miners in No. 5 say they were feeling ever-increasing pressure to meet production goals. Mike Boyd and several other miners said workers often got flak from company bosses if they turned off machinery because of concerns about gas. Company officials denied it. In the 10 days leading up to the accident in No. 5 mine, workers in Four Section and neighboring Six Section had put out three "ignitions" - intensely hot flare-ups in which small pockets of methane gas caught fire. Key had walked only a few feet up the tunnel when a tremor of worry passed through him. He couldn't see what had happened to the battery charger that had been brought in on Friday. Had the roof fall crushed it? Unseen behind the wall of rock, the charger was still running, its electric arc sparking in the darkness, waiting for fuel. Tony Key heard the explosion before he felt it. He half-turned to look but found himself hurtling through the air. He bounced several times on his side before coming to rest 50 feet away, half-buried in a pile of dirt and coal. Disoriented and blinded by the swirl of coal dust, his headlamp blown from his head, he thought at first that he might be dead. As he clawed his way out of the rubble, he reached for the self-rescue apparatus in a tube on his belt. In the darkness, Key fumbled with the mouthpiece and activated the airbag designed to convert carbon monoxide into breathable oxygen. Key was terrified. He was usually mellow and unexcitable, speaking only in slow, measured tones; but he'd never been through anything like this. It was 5:15 p.m. on Sunday, Sept. 23, 2001. Less than a minute had passed since the roof fall in Four Section of the No. 5 mine, but it had been time enough for a pocket of gas to escape, reach the electric arc of the battery charger and ignite. A few yards from Key, Michael McIe staggered to his feet with the vague feeling that he was on fire. He remembered the mantra his young daughter recited from school: Stop, drop and roll. That's what he did, rolling about in the dark and patting himself frantically. McIe heard moaning. He hollered for his friend, Gaston Adams Jr., the third man who had been working on the roof with them. McIe dragged himself toward Adams' headlamp, the only one still working. He could barely make it out, the dust was so thick. McIe found his friend on the ground, surrounded by chunks of concrete blasted from the nearby wall. I can't move, Adams said. For a moment, McIe thought about trying to carry Adams, who weighed more than 240 pounds. But, fearful that Adams might have a broken back, he discarded the idea. Adams gave him his light to go for help. With Key clinging to his work belt, McIe headed down the tunnel in the direction of the section entrance, several hundred yards away, holding the light high so they could follow a cable running overhead. A short way down the tunnel, they stumbled into Skip Palmer, nicknamed Brutus, who'd been ferrying materials to Four Section on a motorized rail cart. Palmer was just picking himself off the ground. The three of them got in the cart and rode until they could ride no farther. Across the tracks, pipes from Four Section's ventilation system lay in a useless heap. Closer to the source of the blast, the force of the explosion had shattered concrete walls, another part of the ventilation system that carried good air into the mine and bad air, laden with methane, out. Any methane seeping into Four Section now had no way to get out. Key skirted the wreckage of the ventilation pipes and made his way down the tunnel on foot, looking for a phone that he knew was somewhere just outside the section entrance. By now, three other miners working nearby had made their way up the passageway to investigate. Key and two of the men climbed into a six-passenger "manbus" that was still running and made it to the phone. One of his companions told him the phone wasn't working; he'd already tried it. But Key frantically punched its black emergency page button again and again. Finally, he got through to the mine's control room, which sits on the surface next to the mine's elevator shaft. "There's been an explosion," Key said. "We need lots of help. Mine rescue, helicopters, ambulances, everything." Thirty-two men were scattered throughout the vast Jim Walter No. 5 mine that evening. As emergency telephones bleated out instructions, the men began moving through the vast complex of caverns and tunnels. Had they scrambled to the surface, only Adams, too injured to make it out, would have perished. But that is not what they did. Like the New York City police and firefighters who, just days before, had rushed to the World Trade Center towers, the miners raced not from danger but toward it. Miners know what underground fires and gas explosions can do; the annals of mining abound with tragic examples. In Monogah, W.Va., in 1907, 362 miners died in the worst mining accident in the nation's history; in Farmington, W.Va., in 1968, 78 perished; in Oven Fork, Ky., in 1976, 26 miners and inspectors were killed. But miners have a creed: When trouble happens, you save your brothers. You also save your livelihood. You save the mine. After Key made his call, he realized how much his back was bothering him. His companions told him to lie down on the floor of the tunnel, then went back to confer with the others. Soon, McIe and Palmer emerged from Four Section on a rail cart. They picked up Key and started toward the mine entrance. Through the gloom they saw a light in the distance. It was a manbus carrying six men who had come from two miles away. It had been 20 or 30 minutes since the explosion. The first help had arrived. McIe, in pain from three cracked ribs, recognized Bit Boyd, an old fishing buddy and a shear operator on the longwall. Boyd, 38, was one of several men who had been vocal recently about gas problems in the mine. Boyd and the five men with him were shocked at how bad McIe, Palmer and Key looked. Key was barely recognizable, his hair was standing straight up and his face completely blackened. McIe was holding a rag to his head, stanching a cut on his forehead. Palmer appeared to be in shock. McIe and Palmer clambered into the back seat of the manbus. The rescuers helped Key lie down in front. A man was designated to bring them out. "Get the hell out of here," Boyd told them. Before heading off in the direction of the mine entrance, Key warned the rescuers that with the ventilation system in ruins and the battery possibly on fire, Four Section might explode again. As the injured men headed down the tracks, Boyd and his four remaining companions headed the other way, toward Four Section. Dave Blevins, the foreman in charge of the shift that evening, was near the elevator shaft when he first got word of trouble. Several hours earlier, he had just sat down for lunch. Wanda, his wife of 36 years, had spent the morning cooking all his favorite foods: chicken and dumplings, green beans, mashed potatoes, cole slaw and blackberry cobbler. "Why I decided to cook at all that day, I have no idea," she says. Blevins normally had Sundays off, but he was scheduled to go on vacation in a week, and his company wanted him at work. The foreman was popular with the men for his attention to safety and for his fairness. Once, after criticizing a worker in front of others, he gathered the 100 men working the shift so he could publicly apologize. Many men would sign up to work only his shift. Wanda worried about her husband, although he'd never been hurt in 34 years underground. He had taken her down once, back in West Virginia where they used to live. She got so scared, she cried. As he headed out the door, Wanda Blevins told him she'd wait up. He gave her a kiss on the cheek and jumped in his truck. He'd been at work a little over an hour when he heard about the trouble in Four Section, 3½ miles east. He hopped on a manbus and headed that way. Just ahead of Blevins, 2½ miles west of the roof fall, Ricky Rose and two other "belt crew" workers were busy repairing a section of the mine's conveyer belt. A phone near them began sounding an urgent page. It was the control room, Rose says, alerting them that there had been an "ignition," of gas in Four Section and asking them to go help put it out. Ignitions are fairly common and usually no cause for alarm, but it is paramount to jump on them quickly before they race out of control. According to Rose, the control room made no mention of an explosion. Rose and several other miners say this was the first of several conflicting stories the control room relayed. Harry House, the control room operator that day, surveyed an array of instruments that monitored activity underground. However, it is unclear how much information he had in the crucial hour after the explosion. House has not responded to requests for an interview but has told federal investigators he consistently informed miners there had been an explosion. Responding to the order from the control room, Rose's group mounted a rail cart and headed toward Four Section. A short distance down the track, they flagged down their boss and four other belt crew workers to explain where they were heading. Were they absolutely sure, a supervisor asked. They needed to fix the belt in time for the next shift. House was insistent, they explained. Rose and his two companions rode on in silence, winding their way through the mine tunnels, until one of them suddenly spoke up. "I got a bad feeling about this," he said. Why were they going to fight a fire that was a half-hour away? By the time they got there, it would either be out or burning out of control. A second miner agreed. They should be heading for the surface, he said. Sitting in the front of the cart, Rose listened in silence. He was a gruff, chain-smoking, Harley-Davidson aficionado. Usually nothing scared him. But quietly he started to pray. Should Four Section explode again, fire and debris would have nowhere to go but straight at them through the tunnels. The rescuers were going down the barrel of a gun. Editor's note: This is the last part of "Death Underground," a three-part serial that tells the story of what happened during America's worst mining disaster in nearly two decades. Brookwood, Ala. (AP) - Gas was slowly gathering in the mine's Four Section. A half-hour after the first explosion, it was once again a powder keg. By now, three miners from a neighboring work area had made their way to Four Section and reached Gaston Adams Jr., the lone man who had been too badly injured to walk. Bit Boyd and four men who joined him along the way were in two manbuses, approaching the entrance to Four Section. Just behind them, about a quarter of a mile from the section entrance, 11 more miners gathered to decide what to do. Ricky Rose was there with seven others from his "belt crew." Dave Blevins was there with two men he had found spraying tunnels with flame retarding rock dust. Many miners felt the company had been scrimping lately on fireproofing material, a charge the company denied. Blevins, one of the No. 5 mine's most respected foremen, took charge. He sent Rose and three others off to find a telephone and alert the control room that three injured men were on their way out. And he asked for volunteers to go with him to fight the fire they believed was burning in Four Section. Immediately, three men from the belt crew jumped on the bus. Jerry Short was about to join them, but a friend stopped him. The self-rescue apparatus, which was worn on their belts and converts carbon dioxide into oxygen, wasn't designed for firefighting, the friend said. It was meant for escape. Leaving three miners, including Short, behind to await Rose's return, Blevins and his three volunteers drove toward danger, Boyd's group already on the move ahead of him. Now, a dozen men were inside Four Section or approaching the entrance. Rose had ridden about two minutes, searching for a telephone, when he bumped into a crew coming from the mine's main production area. They needed to go help fight the fire, Rose told them. The longwall crew couldn't believe what they were hearing. The control room, they said, had just ordered them to evacuate. Rose didn't know what to make of that. Seconds later, out of the corner of his eye, he saw dust swirling straight toward him down the tunnel. Four Section had exploded again, 50 minutes after the first explosion, this time much more powerfully. Superheated, 2,500-degree flames barreled through the section at 900 feet per second. The blast tossed a 12-ton scoop 80 feet against a coal rib, bent ¾-inch steel, leveled concrete ventilation walls. At the spot of ignition, it tore out a crater 50 feet long and 30 feet deep. Eight men - the three who had first reached Adams and Boyd's group of five - were hurled through the air. A 1,500-pound rock landed on Adams. A ball of fire rushed over the eight men so quickly that it barely burned them, but it consumed all the oxygen in the section. Lying there in the darkness, in a fierce rain of debris and coal dust, all eight suffocated. At the entrance to the section, the manbus carrying Blevins and his three volunteers was blown off its tracks. A wall of compressed air, moving in front of the fireball, hurled the vehicle against a wall of coal. The manbus slammed back down with two men still inside it and Blevins beneath it, his chest crushed. A fraction of a second later, the fireball rushed past, sucking the oxygen from the air. The fireball rolled on through the tunnels, setting equipment on fire and looking for an outlet. It found an airshaft, rocketed 2,100 straight up, blasted from the surface of the earth and momentarily lit up the evening sky. By diverting the fireball, the shaft saved Rose's life. The swirling whirlwind he had seen coming through the tunnel knocked him and the seven men around him off their feet, enveloping them in a choking cloud of soot. With the dust came a sound - the loudest thunder Rose had ever heard. It sounded, he said later, like the whole mine was falling in on him. Around him, Rose heard men yelling to get out. He felt his way back to the manbus and flipped on the headlight switch. The soot was so thick that he couldn't tell if it was working. As others piled on, he grabbed the gas lever and raced toward the mine entrance. A few hundred yards closer to the blast, Short and the other two men who had been waiting for Rose to return scrambled to their feet. Holding onto one another, they felt their way along the tracks in pitch darkness for 15 minutes before finding clean air. There, they encountered a miner just arriving from another part of the mine. The control room operator had told him a ventilation wall had fallen and sent him to help, he said. The others ordered him to go back the way he came. It took Rose and his group 20 minutes to reach the elevator shaft, located 3½ miles from Four Section. It was 6:30 p.m., and the elevator cage was still up top. Rose grabbed the telephone: "You got people on the bottom that's scared to death and want to come out." He called three times before the cage came. The mine's trained rescue team interviewed the 19 miners who escaped to learn what they were dealing with. Of the 32 men who had been working the shift, 13 were still inside. About 8 p.m., rescuers entered the mine and moved cautiously through the tunnels toward Four Section. They found Raymond Ashworth, one of Blevins' volunteers, near the section entrance. He was conscious but burned from the top of his head to the soles of his feet. At 11:30 p.m., he was evacuated from the mine and then airlifted to the University of Alabama Medical Center in Birmingham. By the time his wife, Cathy, got there, he had slipped into a coma. All she could do was ask the nurses to clean the coal dirt from his swollen tongue. The next day, he died. Moving into Four Section, the searchers found the bodies of Blevins and his two other men. They stopped and took air readings. The methane concentration was high. So was carbon monoxide, indicating that the section was still burning. The searchers were in the barrel of a gun that was primed to go off again. About 6:30 a.m., with no hope of finding more survivors, the rescue team pulled out. That morning, the mine was flooded to put out fires now raging in the tunnels. Once the fires were out, the water was pumped out. Over the next few months, searchers explored the mine piece by piece. Working in short shifts to avoid heat exhaustion, they would creep along a few hundred feet, halt, and build temporary seal so they could ventilate the section. Then they would explore another few hundred feet, stop and do the same thing. On Nov. 2, more than five weeks after the explosion, searchers recovered three bodies at the entrance to Four Section. Six days later, the last nine bodies were found. The mine reopened in mid-December, an early Christmas present for workers who'd been sitting home for nearly three months. Today, there are still more questions than answers: Should more have been done to fix the roof in Four Section before the accident? Had the company been dealing adequately with the mine's gas problems? Why were so many men directed to a section of the mine that had already exploded once? The federal Mine Safety and Health Administration has conducted an investigation but has not released its report. However, the agency has admonished the mine owner, Jim Walter Resources, for having "no responsible person who took control of the situation" during the accident. The agency also declared the mine's firefighting plan inadequate. Although federal law requires that firefighting and evacuation be simulated every 90 days, several miners interviewed recently were hard-pressed to recall an evacuation drill and said firefighting drills were usually limited to a foreman running through a checklist. The company declined to comment on firefighting procedures, citing the pending investigation. However, the mine's firefighting plan has been revised with an emphasis on improving coordination from the control room. In recent months, the mine has been cited for numerous violations, including accumulations of coal dust, ventilation problems and inadequate roof support. The Bush administration's new budget calls for a 5 percent cut in funding for MSHA's coal mine enforcement. Experts say that could mean fewer inspectors. In September, a thousand miners, family members and company officials marked the one-year anniversary of the accident by erecting a memorial. Among those who perished, Dave Blevins has been singled out perhaps more than any other as the embodiment of courage. His tombstone in a Tuscaloosa cemetery is inscribed: "Son, Husband, Father, Grandfather and Hero of JWR #5 Mine Explosion." His son, Dave Jr., who worked at neighboring No. 7 mine, has led the drive to make the mine owner pay. He's a natural leader, just like his dad. Ten of the 13 families that lost breadwinners have filed wrongful death lawsuits against the company, alleging negligence. Jim Walter Resources denies it was negligent and characterizes the accident as unforeseeable. The company says the miners who were killed and injured understood the risks but chose to follow their creed and go to the aid of their brothers. Of the three men injured in the first explosion, only Key has returned to work underground, over his wife's objections. He wanted to prove to himself that he could do it. McIe, the man who led Key to safety, spends his days tramping through the woods, under doctor's orders to do something that gives him peace. Troubled by nightmares, he is on anti-anxiety medication. Rose, the miner who prayed as he headed toward Four Section after the first explosion, is back underground. It's the only work he knows. But he asked to be taken off the belt crew, which lost three men. After the mine reopened, he went to the spot where their bodies were found, knelt in the coal dust and wept.